Want to improve your guitar technique, play guitar clean and eliminate sloppy playing & unwanted string noise? You are not alone. Sloppy guitar technique is a very common problem that often makes our playing sound a lot worse than it actually is. Fortunately, it’s quite easy to fix sloppy guitar playing (even if you’ve tried to improve your skills in the past but struggled to do so). You don’t need any special exercises to improve your guitar technique. Focused Awareness. This means seeing, hearing and feeling any imperfections in your guitar technique. Picking Articulation. This is the first half of your 2-hand synchronization. It means clearly articulating the notes you want to hear at the exact moment you want to hear them. The Release. This is the second half of your 2-hand synchronization. It means releasing the string after playing a note without any bleeding, scratches or open string noise. Here is how to use these 3 things to fix to a common problem most guitarists struggle with (notes bleeding together instead of sounding separately). Focused Awareness - The first step to cleaning up sloppy guitar playing is to identify what guitar technique imperfections are holding you back. Many guitar players are not fully aware of every flaw in their technique. You might sense that something doesn't sound quite right, but are not sure exactly what your specific guitar technique challenges are. 1. Record yourself playing a guitar technique you want to improve. Listen back (carefully) at 25%-33% speed. Listen for any unclear notes, excess string noise, scratchy noises between the notes, sloppy 2-hand synchronization or inconsistencies in your pick attack. What notes they happen on. Make a list of those things, so you know exactly what stands in the way of you playing guitar clean. 2. Work with an expert guitar teacher. A great guitar teacher can evaluate your playing and give you useful and unbiased feedback about your guitar technique. Use your teachers’ feedback to clean up your guitar playing and improve your guitar technique. A good guitar teacher not only tells you what to do to play guitar clean, but should also notice problems that you may not really be hearing when you play guitar. More importantly, a great teacher understands the root causes of the problem and knows how to prioritize which problems to fix first, second, third, etc. This is very useful in order to help you improve your guitar technique fast. IF you have an excellent ear, you should be able to identify the fine details of your problem yourself. If not, work with your guitar teacher. The second step to improve your guitar technique is to focus on your articulation. Articulation is the first half of 2-hand synchronization. To play guitar clean you need your hands to fret and pick each note at precisely the same time (simultaneously). Play loud enough so that you can truly hear what is happening as you play. Tip: an easy way to make your playing louder is to dig the pick a little bit deeper into the strings. 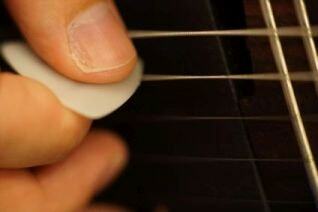 This improves your guitar playing articulation without using more force from your picking hand. Answer: Make sure you are not digging the pick into the strings too much. 1/4 of an inch is more than enough to produce a very loud note. Also, angle the pick between 20-30 degrees towards the head of the guitar (where the tuning pegs are). This allows the pick to cut through the string like a knife, so you can play very fast with powerful articulation. See the photo that shows how much you should angle your pick. Note: don't angle the pick more than 30 degrees. This creates a very sloppy, scratchy sound (especially on the thicker, wound strings). When you are practicing something slowly, do NOT change ANYTHING about how you approach and articulate each note. Most guitar players actually play very differently when playing slow compared to playing fast. This is a big mistake. Test your level of lead guitar skill and improve your weaknesses. watching these free guitar videos. ... you will NOT fully improve your guitar technique. This is because the sound you make when playing will be different, making it harder to detect and identify any problems with your articulation. The third step toward clean guitar playing is the release of the note you are playing. For most guitar players, the release is the hardest problem to detect and correct. Reason #1: Once guitar players articulate a note cleanly, they often ignore what immediately comes after (either a small sloppy noise at the end of the note, or the end of a note slightly bleeding together with the start of the next note). Reason #2: The noises between notes are very hard to hear. This is true when you practice your guitar with a clean tone (no distortion). Playing guitar with a clean tone almost always masks problems in the release phase of playing a note. This is why many people think their guitar playing sounds pretty clean when practicing without distortion, but sense something is wrong when they later play with distortion. You might not be sure what the problem is… or worse, you do not hear the problem at all (but other people do). This is why focused awareness is so critical. I use multiple steps to help my guitar students fully solve this problem (not all of them can be fully demonstrated in an article). That said, here are the absolutely necessary steps toward correcting problems with the release of a note. Practice slow (but do NOT change ANYTHING in the way you articulate OR RELEASE a note compared to when you play guitar fast!). Listen carefully for any subtle noises in between your notes (you will probably notice a scratchy sound just before you play the next note). If you have a hard time hearing anything, record yourself and listen back to the recording at 1/2, 1/3 or 1/4 of the speed (I guarantee you will hear this short scratchy sound now!). To help you use these steps during your guitar practice so you actually improve your technique, download this free guitar technique cheat sheet. (It’s free and no email address is required). 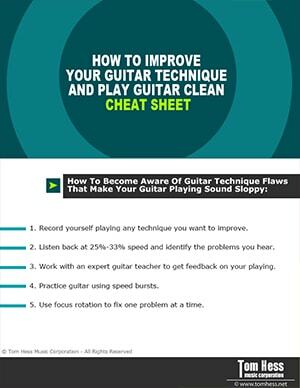 Print it out and study it, so you know what to focus on to improve your guitar playing. There can be several reasons why your guitar playing is not clean during the release of a note. The most common reason is this: When you release a note, your brain is probably telling your finger to lift off (make an upward motion away from the string you just played). This can cause all sorts of nasty guitar technique problems (fatigue, slower guitar playing speeds, and sloppy guitar playing). The solution is to stop your brain from sending your fingers instructions to lift off of each note. Instead, you want your brain to send a message to simply relax. When your finger relaxes, it will naturally, immediately and effortlessly release the note you just played. Because the motion is now effortless, you can play guitar faster and for a much longer time (and most importantly) with greater ease. Because your brain does not give the finger the instruction to make a ‘lift off’ motion, this actually prevents your finger from moving prematurely. This is a major cause of the sloppy scratchy sound that may be present in your guitar playing. Doesn't it feel good to realize that you CAN improve your guitar technique and clean up sloppy guitar playing? Of course it won’t happen over night. It will take some time and consistent practice. But the benefits of being able to play guitar clean are well worth the patience required. Want to learn 5 simple guitar playing tricks that make you sound better in only 10 minutes? Download this free guitar playing eGuide and learn how to sound like a guitar playing badass and impress all your friends with your guitar playing, even if you’re not an advanced guitar player yet. About Tom Hess: Tom Hess is a guitar teacher, music career mentor and guitar teacher trainer. He teaches rock guitar lessons online to students from all over the world and conducts instructional live guitar training events attended by musicians from 50+ countries. Learn how to improve your guitar technique with electric guitar lessons.